Happy April! We celebrated Adaline turning two months old this past weekend and took advantage of the beautiful weather by doing some park hopping, visiting the lake, our favorite bakery and spending lots of time in our backyard potting some herbs, playing with the girls and starting to design our chicken coop! I still can't believe that Adaline is two months old now...Where did the time go?? Wasn't she just a tiny newborn like in that photo?? Life with three little girls is just so sweet; my days are often busy, tiring and long but I truly can't imagine a better, more fulfilling way to spend my time. One of the items that has made life with three much easier has been our DockATot, a multi-functional lounging, playing, resting and snuggling dock for your babe that can easily be transported anywhere; it was created in Sweden with the modern mom in mind and I can't imagine life without it. We used one with Penelope beginning when she was a few months old and we loved it; we have been using one with Adaline since she was born. It can be used for safe co-sleeping, changing and more. With its built in handle, I love that I can pick it up and move it room to room to follow Della's big sisters around the house. Because let's be honest, when are they not moving?! The DockATot features a plush cocoon-like design for optimal protection and durability. Of course as Moms we know that babies need a nurturing and cozy surrounding and naturally feel calmer in a smaller environment which mimics the womb. The DockATot creates that in a stylish, travel-friendly product available in two different sizes -- the DockATot Deluxe+ and the DockATot Grand -- ranging from 0-36 months, based on the age of your child. The DockATot Deluxe+ is made for babies from birth to 8 months (Stage 1 / approximately 5-22 lbs) and the DockATot Grand is made for babies 9 months to 36 months (Stage 2 / approximately 22-40 lbs). The Grand can be used for all the same activities as the Deluxe as well as a way to facilitate comfortable sleeping in toddler beds. Additionally, the bumpers on the Grand act as a bed guard for young kids, allowing them to settle more easily in a bigger bed and allow for a smoother crib to bed transition. Penelope and Olivia both love playing and lounging in our Grand Dock. Even Olivia, at age 4, fits perfectly in it and always says how cozy it is. When Penelope was a baby, we used her DockATot for nap time, tummy time (propped up on the edge), and including her with us wherever we were in the house. 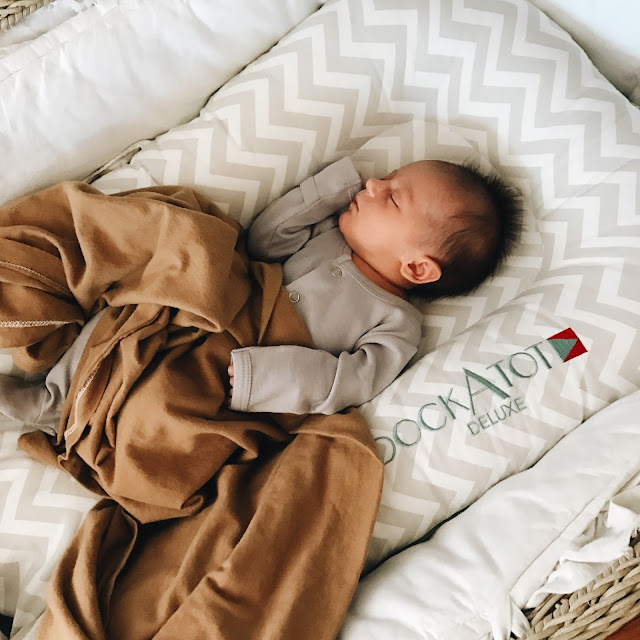 For Adaline, we have been using her DockATot since birth, for lounging during the day, naps and nighttime sleeping. It is the absolute perfect size to fit in our rolling bassinet and I truly believe a huge reason she is such a great sleeper is that she is so cozy in her dock at night. The bassinet itself without the dock is so spacious, which is nice as she grows but is often something babies don't like when they're so used to being cozy inside. For more tips on how to use the DockATot or to decide which size is best for your family, you can visit the FAQ page here and read all about the unique safety features of the DockATot here. DockATot also features a fully removable 100% cotton cover (a necessity with three kids) which makes machine washing extra easy. I feel like I do laundry seven days a week (any other Mamas feel that way?) and it's so handy that I can just throw the cover in as needed and it comes out looking brand new. One of their newer products that I love are the travel bags, which make it super easy to bring to my parents' house when we visit or throw it in the car if I'm going to be at a playdate for a few hours and want a safe place for her to nap while we're there.